An upcoming stay in the Big Apple? Find the best areas to stay in New York City to pack your bags and enjoy your trip! New York is the most populous city in the United States with 8.5 million inhabitants spread over 1,215 km², a surface area 11.7 times larger than Paris! A cosmopolitan city by essence, New York is all at once an economic, historical, and cultural icon, attracting more than 50 million visitors a year. Indeed, the famous “city that never sleeps” has appeared in countless songs, films, plays, paintings, and photographs. Times Square, Broadway, Central Park, Manhattan, Wall Street… New York is packed with world-renowned landmarks and neighbourhoods. Wondering where to stay in New York? It’s normal to feel a little lost: this megalopolis is gigantic. Spread over five boroughs – Manhattan, Brooklyn, Queens, Bronx, and Staten Island – the best neighbourhoods to stay in New York are numerous: there are more than a hundred! Here is a guide to help you find the best place to book your hotel or apartment in New York City. Manhattan is arguably the best known and most visited borough in New York. Home to famous places such as Wall Street and Central Park, it is New York’s tiniest district yet also the densest. Manhattan is where everyone goes, and the neighbourhood is always caught in a whirlwind of activity. So don’t expect to find a calm and relaxed atmosphere on the peninsula, it will be quite the opposite. The area features some of the city’s most trend-setting, lively, and artsy neighbourhoods, such as SoHo, Nolita, and Tribeca. Filled with an impressive number of shops, Manhattan is THE place to embark on a successful shopping trip. Offering dazzling entertainment day and night, this is the part of Manhattan where you’ll find most of New York’s bars and nightclubs to party the night away. 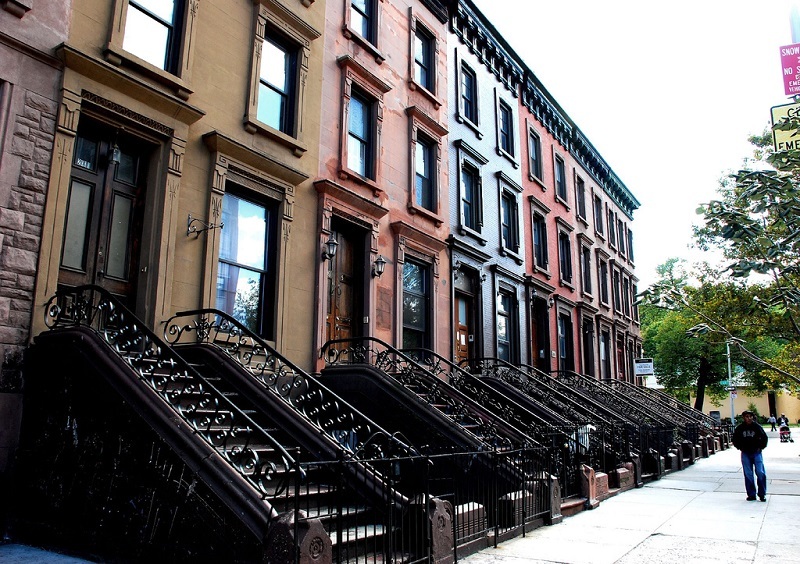 The East Village and Lower East Side are less touristy, and therefore more authentic. Lower East Side is a young and lively party neighbourhood, packed with numerous trendy bars and restaurants. In addition, accommodation rates are usually lower than elsewhere in Manhattan. If you plan to stay in New York with your family, expect your nights to be a little noisy. In Manhattan, you’ll find a number of well known areas that are a must-see during your stay: Times Square and its endless entertainment, Herald Square – featuring the Empire State Building, 5th Avenue, Madison Square Garden -, and Central Park, sandwiched between Upper East Side and Upper West Side. More peaceful and quiet, these last two neighbourhoods will suit you perfectly if you travel with your family. At once vast, lively, culturally rich, and at the same time quieter than Manhattan’s southern quarters, these two neighbourhoods are a great place to stay in New York. Want to see the skyscrapers of New York and its financial districts? Midtown and Lower Manhattan are emblematic of the city’s constant hustle and bustle, mass tourism, and New York’s fast-paced life. And yet these neighbourhoods are very quiet at night. The area is home to many tourist attractions such as Wall Street, the National September 11 Memorial & Museum, the One World Tower, and cruises to see the Statue of Liberty. 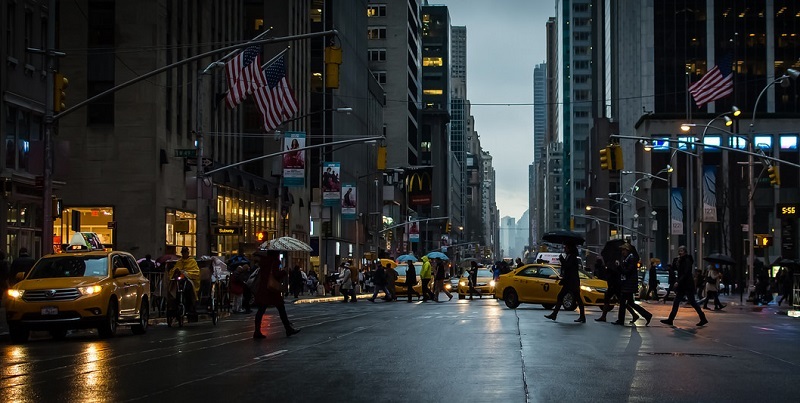 In such a densely populated business district, it will be necessary to plan a significant budget to stay in these neighbourhoods of New York, as hotel rates are likely to be very expensive! Brooklyn is adjacent to Manhattan’s southeastern side. It is the most populated borough of New York, and is a cultural mosaic of many ethnic groups, as everywhere in this megalopolis. 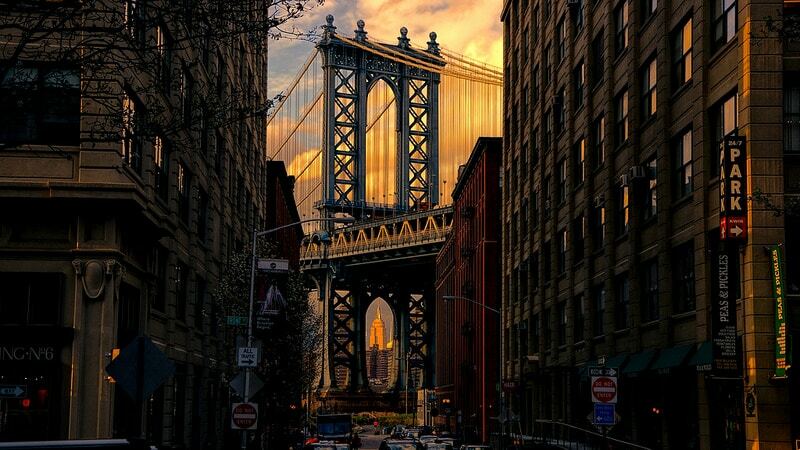 Who has not dreamed of taking the famous Brooklyn Bridge in picture? Well, there you are… Thoroughly gentrified in the past decades, the borough of Brooklyn has witnessed its old disused factories come back to life thanks to artists and trendy businesses. This is why Brooklyn is so popular for visitors, as it offers a fascinating contrast between coexisting social and cultural worlds. Staying in Brooklyn will cost you less than in Manhattan. It’s definitely a nice neighbourhood to stay in New York if you’re travelling alone or with your family. Here, you can rent an apartment in the BoCoCa: an acronym for Boerum Hill, Cobble Hills, and Carroll Gardens. These neighbourhoods are very popular because of their proximity to the Brooklyn Bridge, their green spaces, little houses, and convenience stores. Brooklyn is also filled with great places to visit, including Brooklyn Bridge, New York Aquarium, an array of public parks, the Brooklyn Botanic Garden, the artsy Bushwick quarter, the hipster Williamsburg neighbourhood, many small markets, alternative bars, and last but not least, don’t miss the Brooklyn Brewery if you’re a beer aficionado. Brooklyn offers a good compromise for travellers of all ages: ideal for young people who like to party, the area is sure to please couples and families looking for a quiet and relaxing atmosphere. Despite its bad reputation, the Harlem neighbourhood, north of Manhattan, is centrally located – only 15 minutes by subway from Times Square and 7 minutes from Central Park – and offers a good compromise to stay in New York. Accommodation is much more affordable and the idea most people have of the dilapidated streets abused by gangs is no longer relevant. 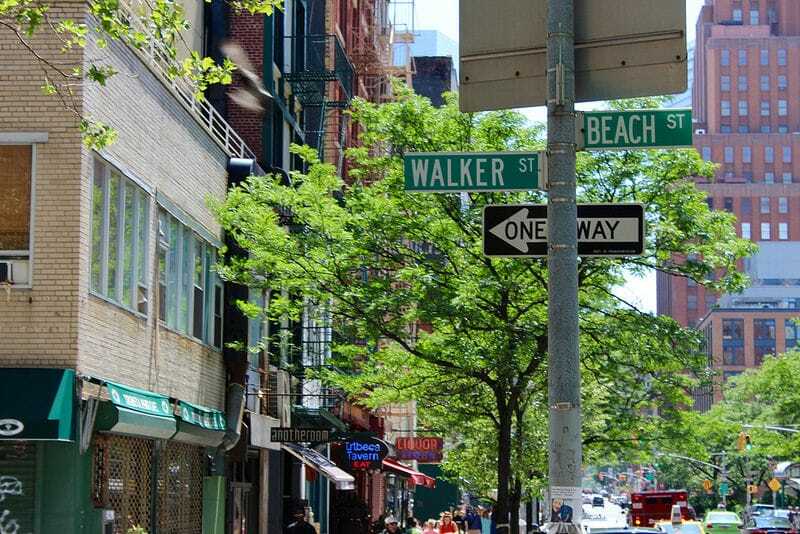 Cheap and conveniently located, staying in Harlem allows you to visit New York on a limited budget while remaining close to the city’s main attractions. Visit the Malcolm Shabazz Market. The New York Botanical Garden (created in 1891), featuring 48 gardens and a library housing more than 50,000 works. Did you know that Woody Allen, Jennifer Lopez, Tony Curtis or Stanley Kubrick all lived in the Bronx? Stay for a few nights and walk the streets in the footsteps of the great actors. Price-wise, rates will certainly be cheaper than elsewhere in New York: the Bronx being in the north, it’s a little far from downtown and the busy side of Manhattan. If you are visiting New York for the first time, we advise you to stay in Manhattan. However, this does imply traveling on a larger budget. It is therefore necessary to book your accommodation in advance by taking advantage of discounts on websites like Booking.com for example. Why stay in Manhattan? There is so much to see and do in New York that it’s best to stay as close as possible to tourist attractions and subway stations. You will also avoid being exhausted after coming home late at night or getting up early in the morning. Rent an accommodation on AirBnb ? We warn our readers to be careful. It is certainly tempting to rent an apartment in New York with Airbnb (or another short-term rental service), however this is illegal. Indeed, a law that came into effect in 2016 prohibits renting a home for less than thirty days, unless it resides there at the same time as its guests. This means that if you want to rent a home on Airbnb in New York, you will have to target the apartments categorised as “shared accommodation”. In any case, you can still try your luck and rent an entire apartment for 5, 6, 7 days or more, but if the owner is fined, you may end up homeless without prior notice. What are the alternatives to Airbnb ? : As has been said earlier, there is a wide array of hotels and youth hostels to choose from in Manhattan and Brooklyn, the two best places to stay in New York. Sometimes a 4-star hotel in the middle of Manhattan is cheaper than an apartment because of the discounts offered by the hotels. Conclusion : To conclude, we recommend you follow this intangible rule specific to New York: the further away an apartment is from the centre and the fewer stars it has (for a hotel), the lower the rate will be. Thus, for an equal service, accommodation in Brooklyn, Harlem, Queens or New Jersey will always be cheaper than accommodation in Manhattan.